Today we depart from the USA and journey to Vilnius, Lithuania. Meals and beverages are served in flight. Arriving in the Vilnius we are met by our friendly PATHFINDERS Manager who assists us with baggage and the transfer to our hotel. After a panoramic tour of the city, the rest of the day is free to explore on our own. Overnight in Vilnius. 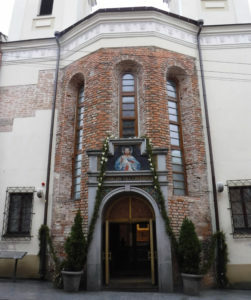 Today we begin at the Gates of Dawn and the image of Our Lady of Mercy, followed by a welcome from the Archdiocese of Vilnius Pilgrimage Center. 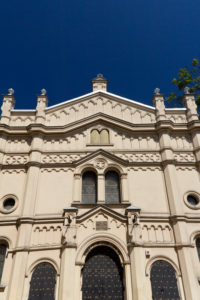 We then visit The Cathedral Basilica of St. Stanislaus and Vladislaus, St. Casmir Jesuit Church, St. Nicholas Russian Orthodox, and the KGB Museum. Dinner and overnight in Vilnius. Today we walk in the footsteps of St. Faustina and Blessed Father Michael Sopocko. We begin by praying the Chaplet of Divine Mercy at the House of St. Faustina. We then visit the Convent of the Sisters of Divine Mercy and several other locations of significance in the message of Divine Mercy, concluding our pilgrimage with Mass at the Shrine of Divine Mercy, which houses the original Divine Mercy painting. Dinner and overnight in Vilnius. 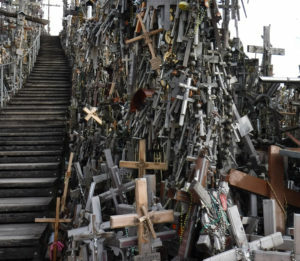 Today we journey to the Hill of Crosses, a significant pilgrimage spot for the faithful of Lithuania, and symbol of the Lithuanian struggle and victory against the Soviet regime. Dinner and overnight in Vilnius. Today we journey to Kaunas and pray with the Benedictine Sisters of Kaunas. 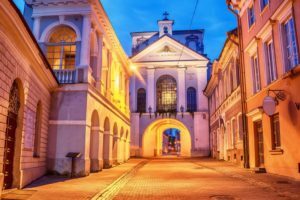 We visit the Kaunas Cathedral Basilica and have time to enjoy the city. 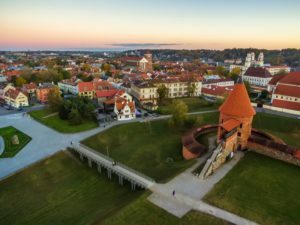 We travel to Trakai to visit Trakai Church of the Visitation of the Blessed Virgin Mary, a testament to the deep Lithuanian tradition of devotion to Mary. Upon return to Vilnius enjoy time for leisure and dinner. Overnight in Vilnius. We board our motor coach and make our way to Krakow, stopping in Warsaw for the evening. After settling into our overnight accommodations enjoy the rest of the day at leisure. Overnight in Warsaw. Today we depart Warsaw and journey to the Monastery of Jasna Gora, which houses the painting of the Black Madonna. We celebrate Mass and tour the grounds before arriving in Krakow. We check into our hotel and then explore Old Town Krakow including the Wawel Cathedral and the Basilica of the Virgin Mary. Dinner and overnight in Krakow. 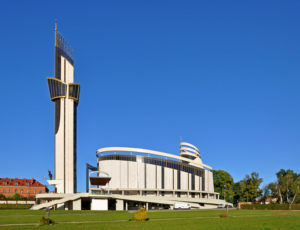 We continue our pilgrimage of Divine Mercy by visiting the Sanctuary of Divine Mercy, St. Faustina’s final resting place and the “Be Not Afraid” John Paul II Center. We then explore the famous Wieliczka Salt Mines. Dinner and overnight in Krakow. Today we begin with a guided tour of Kazimierz, the Jewish Quarter of Krakow. After our walking tour, we will visit Oskar Schindler's Factory and Museum, and Ghetto Heroes Square. The rest of the day is yours to explore at your leisure. Overnight in Krakow. Our pilgrimage today takes us to the sobering grounds of the Auschwitz Concentration Camp and the cell of St. Maximilian Kolbe. 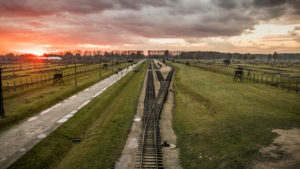 We pause to remember Saint Teresa Benedicta of the Cross (Edith Stein,) and countless others who lost their lives in the gas chambers at Birkenau I and II. After a time of prayer and reflection, we depart for the boyhood home of St. Pope John Paul II in Wadowice. Farewell dinner and overnight in Krakow. We transfer to the Krakow Airport for our flight home, taking with us wonderful and inspiring memories of our pilgrimage, which will be treasured and relived for the rest of our lives.